Shortly after joining NATO in 1999, both the Czech Republic and Hungary started procurement processes to acquire new major combat aircraft to replace ageing Russian planes. In each case, the Gripen, produced jointly by Saab (Sweden) and BAE (UK), was selected over rival contenders, including the US F-16, believed to have been the favourite in each case. Subsequent allegations of corruption centered around a network of agents employed by BAE Systems to bribe politicians in Central Europe to sway decisions in favour of the Gripen, in particular in the Czech Republic and Hungary. Alfons Mensdorff-Pouilly, an alleged key middleman in the Gripen scandal, exits a Vienna, Austria, courtroom on Jan. 17, 2013. Getty/AFP, Dieter Nagl. Hungary: 14 JAS 39-C Gripens, on a 10-year lease (2006-16), extended to 2026 in 2012. Count Alfons Mensdorff-Pouilly – Austrian businessman and BAE’s agent for Gripen sales in Central Europe. Otto Jelinek – former state finance minister in Canada, later a Prague businessman and BAE agent. Richard Hava – head of Czech state arms firm Omnipol in 2003 and a BAE agent. Victor Orban – Hungarian Prime Minister (1998-2002, 2010 – ). Michael Zantovsky – Czech Senator for the Civic Alliance Party; alleged in 2002 that he had been offered SEK 10 million for his party in return for his vote for the Gripen. Milos Zeman – Czech Prime Minister (1998-2002). The Czech Republic started looking to buy new fighter aircraft in 1999, upon joining NATO, and issued a tender in 2000. Hungary likewise initiated a competition in 2000 to replace its Soviet Mig-29 fighters. The JAS 39 Gripen, made by Saab in what was at the time a joint venture with BAE Systems, Gripen International, was one of the competitors. The Czech Republic selected the Gripen in 2001, and the Czech Government approved an order for 24 planes for USD 1.8 billion in 2002. However, the deal was cancelled later that year as the government needed the money for reconstruction after the massive floods. Negotiations continued for a smaller purchase of possibly second hand or leased planes, and in the end the Czech Republic signed a USD 750 million deal in 2004 for 14 Gripens leased for 10 years. Meanwhile in Hungary, it had appeared that the American F-16, favoured by the military, was likely to win, but a last-minute change of mind in 2002 by Prime Minister Victor Orban resulted in selection of the Gripen instead. “Hungary: 5 recipients, 126 million kronor; Czech Republic: 20 recipients, 735 million kronor”. Some corruption allegations had emerged already in 2002, when a Czech Senator reported to the police that he had been offered 10 million Swedish crowns (about USD 1 million) for his political party in return for his vote in favor of the deal. A police investigation was dropped after a few months, however, for lack of evidence. The U.S. authorities also alleged corruption in relation to both the Czech and Hungarian deals, leading to U.S. companies Boeing and Lockheed withdrawing from the Czech competition on the grounds that the tendering conditions made it impossible for them to compete with the Europeans. The UK Serious Fraud Office (SFO) began an investigation in 2004 as part of a wider probe into BAE’s dealings following a series of reports from whistleblowers. Subsequent media revelations led to investigations in Sweden and the Czech Republic, as well as in Austria where Mensdorff-Pouilly was also involved as an agent in multiple arms deals. In total, investigations were pursued in 8 countries, including the US, due to the complex financial networks through which payments were made. However, Hungarian prosecutors have never investigated the affair, although there was a Parliamentary investigation in 2007, the results of which were kept secret. The investigation apparently encountered problems in that all of the original documentation relating to the procurement process had disappeared. However, the charges were subsequently dropped in February 2010 in connection with plea-deals by BAE Systems in both the United States and the UK in relation to a range of corruption charges. BAE admitted to lesser charges of false accounting, paid a fine of USD 400 million in the United States and BGP 500,000 (USD 625,000) in the UK, and agreed to make an ex gratia payment of GBP 29.5 million (USD 39.4 million) towards development purposes in Tanzania. The SFO claimed that as the US settlement included the Central European cases, prosecuting Mensdorff-Pouilly would represent double jeopardy. Mensdorff-Pouilly was later charged in an Austrian court with money laundering, in connection EUR 12.6 million of bribes allegedly paid to influence the Gripen purchase in Hungary and Czech Republic, but was acquitted in 2013. He was convicted on a lesser charge of falsifying evidence. The judge emphasized that this was not a clean bill of health, and that “the whole thing stinks”. One problem for the prosecutors was proving who received bribes. The Swedish prosecution authorities are continuing to investigate the Gripen deals with the Czech Republic, Hungary and South Africa, and have stated openly that the deals were corrupt. As of yet, there has not been sufficient evidence to convict anyone in relation to the Czech (or Hungarian) deals. Image Caption: Two Czech Air Force JAS-39 Gripens in July 2010. Image Source: Flickr/Creative Commons, Milan Nykodym. Ditu Asiedu, “Czech politicians under suspicion of corruption involving Gripen deal,” Czech Radio, Feb. 21, 2007, http://www.radio.cz/en/section/curraffrs/czech-politicians-under-suspicion-of-corruption-involving-gripen-deal. David Leigh and Rob Evans, “Count named in BAE corruption inquiry,” The Guardian (online), Feb. 21, 2007, https://www.theguardian.com/business/2007/feb/21/arms.uknews. David Leigh and Rob Evans, “BAE files: Czech Republic,” The Guardian (online), Jun. 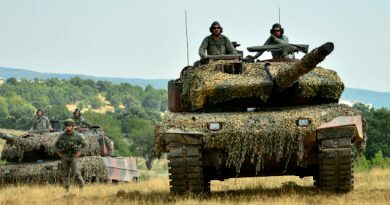 7, 2007, https://www.theguardian.com/world/2007/jun/07/bae23. Nelson D. Schwarz and Lowell Bergman, “Payload: taking aim at corporate bribery,” The New York Times (online), Nov. 25, 2007, http://www.nytimes.com/2007/11/25/business/25bae.html. David Leigh and Rob Evans, “Ex-BAE middleman charged with bribery,” The Guardian (online), Jan. 29, 2009, https://www.theguardian.com/world/2010/jan/29/bae-mensdorff-pouilly-bribery. Eva Balogh, “The Austrian Count and the Gripen sales to Hungary,” Hungarian Spectrum (online), Mar. 4, 2009, http://hungarianspectrum.org/2009/03/04/the-austrian-count-and-the-gripen-sales-to-hungary/. Mike Koehler, “BAE … Inside the SFO,” FCPA Blog, Apr. 30, 2010, http://fcpaprofessor.com/bae-inside-the-sfo. Adam Foldes, “Bribery in Hungary: a close encounter of the third kind,” Transparency International blog, Sep. 21, 2012, http://blog.transparency.org/2012/09/21/bribery-in-hungary-a-close-encounter-of-the-third-kind/. Eva Balogh, “The Gripen affair redux,” Hungarian Spectrum (online), Sep. 26, 2012, http://hungarianspectrum.org/2012/09/26/the-gripen-affair-redux/. “Austrian count cleared of arms deal money laundering”, Reuters, Jan. 17, 2013, http://uk.reuters.com/article/uk-austria-count-trial-idUKBRE90G0J920130117. Magnus Johansson, “Saab avfärdar mutanklagelser” [Saab dismisses bribe accusations], Swedish Television Uppdrag Granskning, Mar. 13, 2013, http://www.svt.se/ug/saab-avfardar-mutanklagelserna. Andrew Feinstein, The Shadow World: Inside the Global Arms Trade (London: Hamish Hamilton, 2011), p. 218. Information from SIPRI Arms Transfers Database.